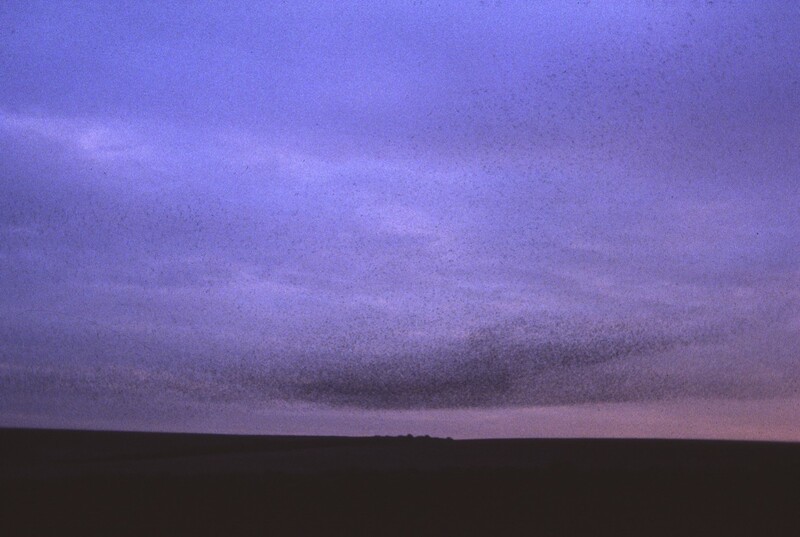 On 27 October we drove down to Brighton in the hope that Christine could witness a murmuration of Starlings: this is the term used to describe the amazing pre-roosting behaviour of large flocks of Starlings just before they enter their roost sites in the late evening. On a good evening this can be one of the most spectacular events that the bird world can offer. For many years large numbers of Starlings have roosted on the piers in Brighton and the RSPB recommends this as one of the best 13 sites in Britain to witness the incredible coordinated aerial manoeuvres of thousands of birds before they descend beneath the pier structures to spend the night in relative shelter. Interestingly, in the 1980s loudspeakers beneath the Palace Pier used to broadcast Starling distress calls each evening, in an attempt to drive the birds away. Now, the louspeakers have gone and the roosting Starling have become a tourist attraction! Unfortunately, two events have diminished the opportunity to see these crepuscular marvels in Britain, and especially in Brighton. First, numbers of Starlings in Britain in winter have declined alarmingly over the past 50 years. This has been due to a decline of breeding birds over much of northern Europe where many of our winter birds originate, along with a decline in the British breeding population, most likely due to various factors associated with the intensification of European agriculture during this time span. Second, the Brighton piers have lost some of their attraction to roosting Starlings as a result of the infernos in 2003 that largely destroyed the West Pier, depriving the birds of sheltered dormitories within its framework. 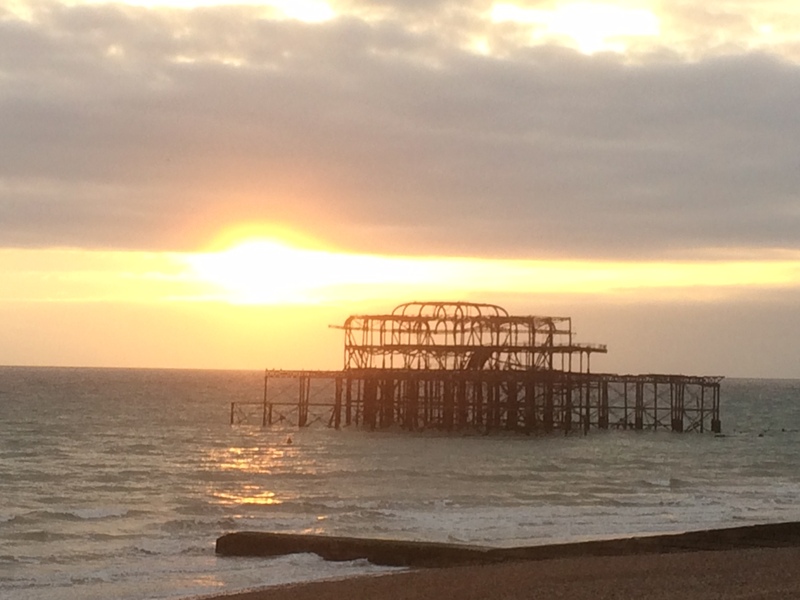 We took photographs of the derelict but now iconic structure against the background of the setting sun and on a cool, breezy evening walked along the promenade to the Palace Pier to await the arrival of Starlings as they returned from their daytime feeding areas inland. On this occasion we were unlucky. Only four small flocks, each of 30-50 birds, arrived and they did not coalesce into a larger coordinated flying circus. Each flock did, however, reveal some of the signs of the displays we had hoped to see. The birds circled the area in very tight formation, amazingly changing direction as a single unit. They appeared to show reluctance to take the final entry into the pier’s substructure, repeatedly flying rapidly towards the pier, spatially separating as they approached, before changing their minds and reassembling into a tight flock that flew off again. But eventually they gained confidence and settled beneath the pier, not as a single roosting flock but in different parts of the framework. We hope that our disappointment was due to the timing of our visit, rather than indicating a further decline in Starling numbers. Late October precedes the arrival in Britain of many Starlings from Scandinavia and December-January would be better months to view the birds.